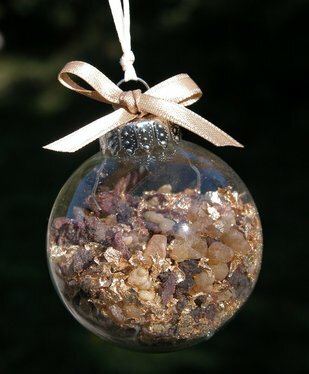 Make a Yule spell ornament to bring luck, prosperity, love, health, or creativity into your life. Fill the plastic halves of the ornament with items that are associated with your purpose. Try a couple of the following, or come up with your own combinations. Additions - Leprechans, four leaf clovers, ladybugs, Sevens, rainbows, stars, horseshoes, green & gold glitter. Work the magick by my will. Where the magick will reside. Magick gift I give to thee. When your ornament is filled, place the two halves together and glue with craft glue if using a plastic two piece ornament, if using a glass ornament simply pop the top back on. Tie a ribbon around the center and then hang your ornament on your Yule tree or place it on your Altar. Several of these ornaments placed in a box make a great gift!